Our friend Christopher Stembridge will be playing a concert on the organ at Trinity College Cambridge at 5.40pm on January 24th. He will be playing Gabrieli, Satie, Byrd, Frescobaldi, Hassler and JSBach. 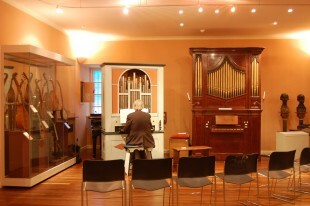 The picture shows Chris playing our Italian chamber organ in the Laigh Room at St Cecilia’s Hall in Edinburgh in 2010, where the Russell Collection is housed, next to the enharmonic organ by Thomas Parker ca1760, which we restored in 1996. Chris was due to give a concert and conduct masterclasses in the music of Frescobaldi and his Italian contemporaries, in whose interpretation he is one of the world’s finest.